What conditions does Menopur Vial treat? Tell your doctor right away if any of these unlikely but serious side effects occur: flu-like symptoms (e.g., fever, chills, joint pain, muscle ache, tiredness). Seek immediate medical attention if any of these rare but very serious side effects occur: weakness on one side of the body, slurred speech, sudden vision changes, sudden severe headache, pain/swelling of the calf muscles, chest pain, shortness of breath. This medication may cause a condition known as Ovarian Hyperstimulation Syndrome (OHSS). This condition may occur during therapy or after treatment has been stopped. Rarely, serious OHSS causes fluid to suddenly build up in the stomach, chest, and heart area. Seek immediate medical attention if you develop the following side effects: severe pain/swelling in the lower abdominal (pelvic) area, nausea/vomiting, sudden/rapid weight gain, decreased urination. List Menopur Vial side effects by likelihood and severity. Before using this medication, tell your doctor or pharmacist your medical history, especially of: other fertility problems (e.g., primary ovarian failure), abnormal uterine/vaginal bleeding, thyroid problems, adrenal gland problems, cancer of the reproductive organs (breast, uterus, ovary), tumor in the brain (e.g., pituitary tumor), ovarian cysts/enlarged ovaries (not due to polycystic ovary syndrome), twisting of the ovary (ovarian torsion), personal/family history of blood clots, blood clotting disorders (such as thrombophilia), obesity, stroke, certain heart diseases (e.g., heart attack), lung problems (e.g., asthma). What should I know regarding pregnancy, nursing and administering Menopur Vial to children or the elderly? Are you taking Menopur Vial? Are you considering switching to Menopur Vial? 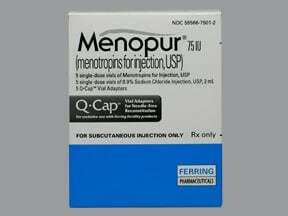 How long have you been taking Menopur Vial?